Some of my cousin’s ashes came in the mail this week. His remains had been portioned and given to those who attended his memorial to take and spread all around the world. I was initially told that there wouldn’t be enough to go around, and asked if I’d make the sacrifice of not receiving any. I made sure to look reluctant when I agreed, but inside, I was so relieved. Andrew and I had talked about God, girls, goals, and nearly everything under the sun- but never what to do with his remains when he left this earth, I felt unburdened. When my uncle told me there were bags left over from the memorial, and asked me if I wanted one, I knew that I was obligated to say yes. Still, I felt completely unworthy of the task at hand. When I wrote that Andrew’s remains were being spread all over the world, I meant it. His friends traveled across oceans to celebrate his life, and likely sought out many of the peaks he scaled on several continents to spread his remains in the places he had previously seen and loved. Me, I live in Arizona. He came here once, and our biggest adventure was at a Planet Hollywood at the Biltmore, which no longer exists. As hard as he would laugh at me spreading his ashes around a Scottsdale mall food court, the fact is I had no idea how I was going to honor him. Yesterday, I visited the Pacific ocean on the California coast, and you three were with me. Fisher, you clung tightly to your mother on a beach blanket while your brothers and I played in the tide. When I had a free moment to myself, I let a passing wave take some of Andrew’s ashes away. I kept some with me, fearing I had made a trite and contrived choice, hoping to be inspired later to honor him in a way that would both relieve some of my grief and match the epic nature of some of the stories I’ve been hearing and reading about the way other friends and family had done the same. The rest of the morning we played together in the ocean. I was everything from a seaweed monster to an expert shell hunter, fulfilling whatever imaginatory whim either of you could come up with. It was an incredible day with my wife and boys, and by the time we had to leave, I realized that there were fewer times in my life that I had so much fun. My time with Andrew was all about the kind of unforgettable fun and adventure that we had together yesterday. Realizing this made me let go. 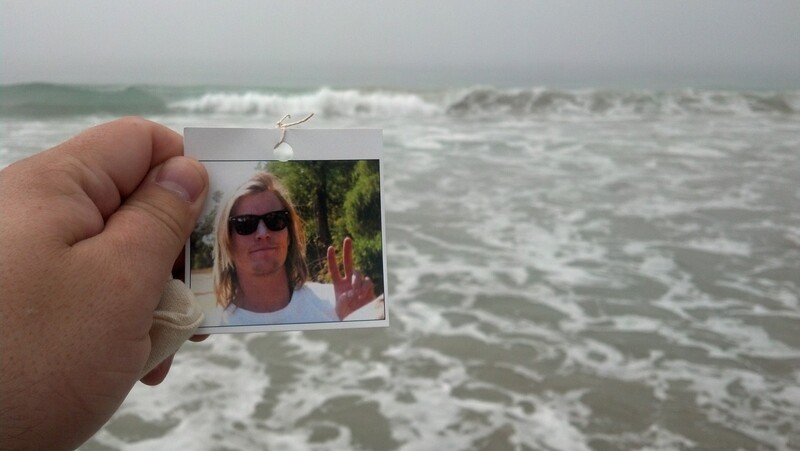 As we were leaving, I let the waves take the rest of his ashes. I shed a tear behind sunglasses, and walked away knowing that I did more to honor him with every moment of laughter I shared with my children than I ever could have by selecting a location for his remains. Some day, I won’t be around anymore. My memory, if I’m lucky enough to have a long and lasting impact on your lives, may at times feel like a burden. Let me make it easier for you by telling you what I want. When I die, bury me somewhere near my mother. No matter where you’re at on Earth come together at least once a year with the sole purpose of laughing. Write your children letters about my mistakes, and what I learned from them. Most of all, trust that however you choose to grieve, I’d be satisfied- not because your actions will honor who I am, but because I love you so much that anything you did to remember me is made valuable because you were the ones doing it. I don’t want to make you sad, and I don’t know how old you’ll be when you read this. All I know is that I had so much fun yesterday that it woke me up to what I should really be doing to honor Andrew, and that’s having a great time with the three of you.